“I was born in a cloud,” sighs art-rock sorceress Kate Bush on her mesmerizing 10th studio album. “Cloud-like” is a fairly fitting adjective for 50 Words of Snow, which blooms into your headphones with “Snowflake,” an immersion of pillowy piano ambience, synth pulses and guitars that flicker like a dying flame. “The world is so loud,” Bush sings, her trademark sensual lisp masked in heavenly vocal-room reverb. Snow, perhaps in response to the noise that clogs our every waking human moment, is defined by its stirring stillness—the radiating quiet that haunts every ghostly piano drop and evaporating syllable. Art-rock legends tend to punch the clock on their own terms. Just like her former collaborator Peter Gabriel (whose orchestral versions set New Blood came out this fall), Bush emerged from her hermit-like musical isolation earlier this year with Director’s Cut, a collection of intensified re-workings from her varied discography. But it’s been a long six years since the double-disc epic, Aerial, Bush’s last album of new material. The exact opposite of a rousing “I’m back!” statement, “Snowflake”’s hushed piano chords wander gracefully, patiently in slow-motion mist. It’s a wondrous calm from an artist in absolutely no hurry, as if Bush has spent the last half-decade making snow angels on a distant mountainside and sipping fine wine by her living room fireplace, tinkering with waves of melody when they happened to dance through her brain. Though nearly 10 minutes in length, “Snowflake” feels like a luxurious century. 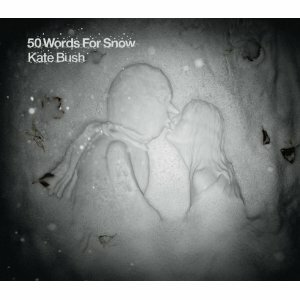 That wintry, unhurried atmosphere defines every second of 50 Words for Snow, Bush’s most striking work since 1989’s The Sensual World. Each track varies only slightly in structure, filled with the same level of sonic craft we’ve come to expect from Bush. It’s an absolute pleasure to hear her closest musical collaborators (bassist John Giblin, guitarist Dan McIntosh, drummer Steve Gadd) playing together again—their instrumental communion is organic and pure, like a perfectly captured live performance. “Misty” drifts by in Talk Talk-styled ambient jazz: percolating double-bass, splash cymbals hovering just above a whisper. The majesty is disrupted, albeit briefly, on one occasion: the stirring build of “Snowed in at Wheeler Street” flatlines thanks to Sir Elton John’s chesty, borderline ridiculous vocals, which feel horribly out-of-place alongside Bush’s airy command. “50 Words for Snow” is…well…exactly what it says it is: Bush counting to 50 in a gorgeous bath of flange, while guest speaker Stephen Fry lists a half-hundred translations of the same word—all layered over the heady rhythmic rush of Giblin’s nimble bass and Gadd’s stacked percussion. It’s a linguistic lesson you never asked for, or even wanted, but also one you’ll never forget.